"It can be stated that the targets from LaserSoft Imaging have excellent quality. They are perfectly suited for scanner calibration and fulfill highest quality requirements." The SilverFast Resolution Target in combination with SilverFast software is a simple way to determine just what the maximum resolution of your particular scanner is! Obtain scans with the best possible crispness and sharpness. An optical, (also called physical resolution) has always been a requirement in high-end scanning for best quality. Unfortunately today with low priced desktop scanners the term "resolution" has become unclear. As a second important application, the target helps you find the optimum sharpness settings for a chosen resolution. You can also find the best compromise for your scanner between high resolution and sharpness and determine which parts of your flatbed scanner are scanned particularly sharply or blurry. The SilverFast Resolution Target is equally well suited for flatbed and film scanners. 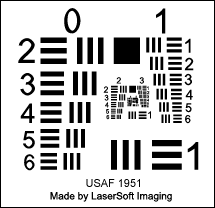 Based on the USAF-1951 standard, LaserSoft Imaging developed the SilverFast Resolution Target to make the actually usable resolution of a scanner measurable. SilverFast Resolution Targets are available for both flatbed and film scanners. The structure and elements of the Resolution Target are defined to an American military standard. On the target there are smaller and smaller elements, each consisting of black bars of precisely defined width and spacing. These individual elements are numbered and organized into groups on the Resolution Target. The smallest of these elements for which the scanner can just differentiate between two bars, for which the intervening space is thus barely still detectable, can be indicative of the usable resolution of the scanner. The Resolution Target can also be used to make statements about the sharpness at different resolutions, in order to find the optimum resolution for scanning and to differentiate the sharpness at different points in the scanned area of a flatbed scanner. Order the SilverFast 35mm Resolution Target (USAF 1951) now in our Online Shop. In the following you will find some general notes on scanner resolution and image sharpness. How to use the SilverFast Resolution Target? dpi, what exactly is that? With the Resolution Target you can determine the best actual usable resolution of your scanner right away. Therefore, you can consult the Quick Manual please. More information about the Resolution Target, in-depth instructions as well as additional application and background data can be found in the Detailed Documentation. One of the most important parameters for describing the quality of a scanner is its resolution. 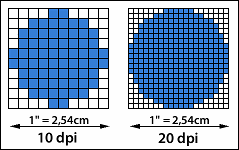 Resolution is a measure of the accuracy with which an image can be recorded; it is expressed in dpi (dots per inch). The higher the resolution of a scanner, the more image details the scanner can detect, and the better you can, for example, enlarge the image later. A scanner with a resolution of 1200 dpi can thus theoretically detect 1200 different points per inch (2.54 cm). Both flatbed and film scanners generally record the image of the original line by line using one-dimensional CCD sensors (charge-coupled device). These light-sensitive components consist of many photocells arranged in a row. Each photocell can detect brightness values and generate pixels from them. The more densely the CCD sensor is populated with individual photocells, the higher the resolution across the width. Lengthwise, a stepper motor is used to move the CCD sensor line by line across the original. The fineness of the steps this motor can take thus determines the lengthwise resolution. The horizontal and vertical resolutions of a scanner, therefore, aren’t necessarily the same. Usually the horizontal resolution, that is, the resolution of the CCD sensor, is lower. It should also be noted that a CCD sensor built into a flatbed scanner can resolve an original much less precisely than the same CCD sensor in a film scanner. The reason for this is the different width for originals of about 20 cm for flatbed scanners and only about 3.5 cm for film scanners, both of which are projected onto the width of the sensor by lenses. The optical system of a scanner is somewhat more complicated than the description above. To record a scan original, the light in a flatbed scanner travels roughly the following path. From the light source, it passes through a sheet of glass onto the original, is reflected, then passes back through the glass into a system of several mirrors, which finally direct it into a lens rod. The light is then separated using color filters or a prism into the primary colors of red, green, and blue, which are then detected by the CCD sensor. To ensure that the rays of light are always the same length, the scanning head with its light source, along with the mirror system and the lens with the CCD sensor, are all moved. Small errors in this delicate system, particularly at very high resolutions, can lead to slightly blurry images. The complex optical system is also responsible for the fact that scanning is not equally sharp at all points on the flat bed of the scanner. A high resolution scan can be very sharp exactly in the center of the flat bed, but simultaneously have significant blurriness at the edges. Interpolation is a process used during scanning that increases the resolution of a scan using a computer algorithm. To do this, additional pixels are subsequently inserted between the pixels recorded by the scanner that are mathematically calculated with special algorithms. Interpolation can give the impression of higher resolution, but at the cost of the image's sharpness. These processes, however, are never able to gain additional information, that is, to add image details or to increase the actual optical resolution of a scanner. The data sheets for modern scanners often show amazingly high resolutions for the devices. CCD sensors and the fine mechanisms of the stepper motors are nowadays so accurate that they permit these resolutions. However, there are a series of factors that mean that the user can only directly utilize these resolutions in the rarest of cases. As described above, interpolated resolution cannot be seen as a usable optical resolution. The often larger resolution of the stepper motor should not be confused with that of the CCD sensor, and the complex optics within the device can cause blurriness during the scan at the resolution limit, particularly at the edges of the image. The entire technically available resolution can therefore usually not be used, but only a significantly lower figure. So how high is the resolution that is actually usable for the user? It is precisely to answer this question that LaserSoft Imaging developed the SilverFast Resolution Target. You can also find the optimum SilverFast sharpness settings for every resolution.